Whether you’re taking your dog to the park or to the dreaded v-e-t-s (shh! ), car journeys with a pooch are a regular part of life for many of us. Yet according to research by Direct Line, more than a quarter of dog owners fail to adequately secure their pets before a car trip. Why does my dog have to be secured? A dog on the loose could distract the driver if they jumped on your lap. But it’s not just safer for you – it’s safer for them if you break heavily or have an accident. Vets revealed to Direct Line that travelling without proper restraint was the main cause of injury or death to dogs inside cars involved in a crash. Is there a law on driving with a dog? 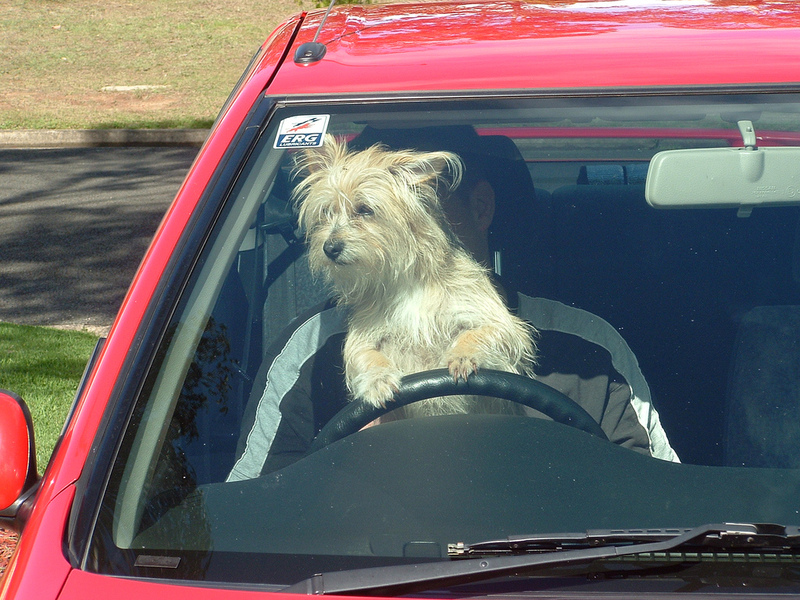 Rule 57 of the Highway Code states that drivers are responsible for making sure dogs (and other animals) are suitably restrained in a vehicle so they can’t distract or injure you – or themselves – during an emergency stop. Vets have reported seeing all sorts of dangerous restraints, including cardboard boxes, harmful chains and ropes, or simply passengers holding the dog on their laps. How should I restrain my dog ‘suitably’? The law allows for a certain degree of discretion, but a seat belt harness, pet carrier, dog cage or dog guard are all considered appropriate restraints – and they won’t break the bank, with a simple seat belt harness costing under £10. It’s safest to let pups ride in the boot, especially if you have a built-in luggage guard which can be interchanged with a metal animal guard, or have space for a comfortable cage. Most dog owners know you should never leave a dog unattended in a car, even for a few minutes, with Dogs Trust reporting less than 20 minutes in a hot car can prove fatal if a dog’s body temperature exceeds 41°C. But they can also suffer from the heat while you’re driving. Open windows and cold air-conditioning is a must – although never let them stick their head out of the window! Consider investing in sunshades, especially if your pet is riding in the boot away from ventilation jets, and always pack water and a bowl.